Read a roundup of Compendium updates, take the monthly anti-bribery quiz, catch up on recent blog posts, and view the calendar of upcoming events. Email not displaying correctly? There were a number of enforcement actions in the United States this month. VimpelCom Ltd. agreed to pay more than US $835 million in disgorgement and penalties to settle charges brought by the U.S. Department of Justice (“DOJ”) and the U.S. Securities and Exchange Commission (“SEC”) that the company violated the anti-bribery and books and records and internal controls provisions of the U.S. Foreign Corrupt Practices Act (“FCPA”) by making at least US $114 million in improper payments to a relative of the President of Uzbekistan to enter and remain in the Uzbek telecom market. The settlement includes disgorgement and penalties paid to settle charges by the Public Prosecution Service of the Netherlands. PTC Inc. agreed to pay more than US $28 million to the DOJ and the SEC to resolve allegations that the Company violated the anti-bribery and books and records and internal controls provisions of the FCPA by providing approximately US $1.5 million in travel, gifts and entertainment to officials to secure and retain sales to Chinese state-owned entities. PTC subsidiaries spent more than US $274,000 on gifts and entertainment for Chinese officials and paid US $1.1 million for Chinese officials to travel to places like New York, Las Vegas and Honolulu. February 2016 Quiz: Are You Up-to-Date on This Month's Anti-Corruption News? There were many developments this month in the world of anti-bribery compliance. Are you up-to-date on the latest news? Take our quiz below to find out. Better yet, share with your compliance teammates and see how your compliance chops stack up! Say goodbye to clumsy, unwieldy spreadsheets and automate your risk assessment and vetting process with TRACEsort. TRACEsort makes it easy for organizations to collect and assess third party risk information through multilingual or custom-built questionnaires. The software integrates seamlessly withTRACE risk-based due diligence services, allowing users to designate risk tiers and initiate the due diligence process automatically upon completion of the assessment. To schedule a live demonstration of the software, please write to TRACEsort@TRACEinternational.org. For many companies seeking to operate in foreign markets, local third parties are essential partners. They play a key role in generating sales, navigating local bureaucracy and understanding business customs. But while intermediaries may be helpful in opening doors, they can also present considerable bribery risk, particularly if they are involved in highly government-regulated activities. This brief guide to assessing third party risk breaks down the risk factors present when working with resellers and distributors, detailing areas of higher and lower risk. 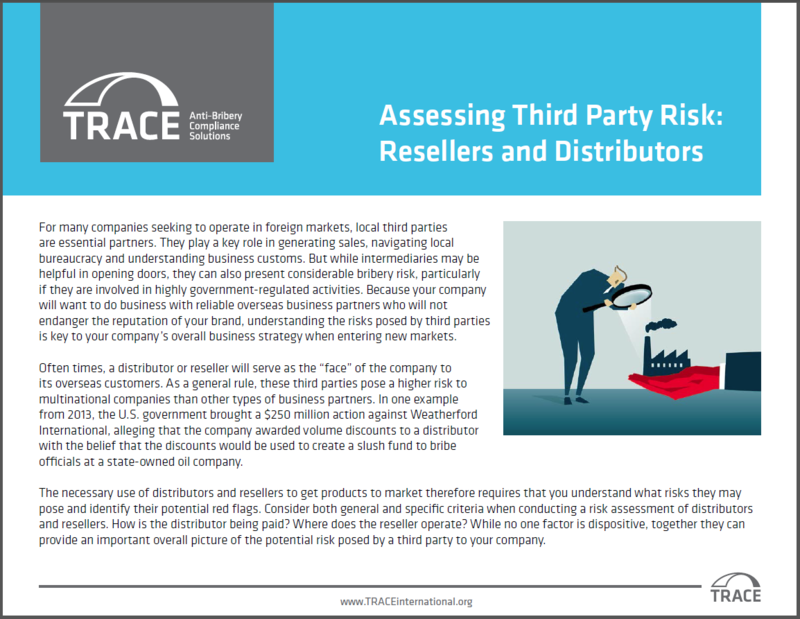 The Assessing Third Party Risk: Resellers and Distributors guide is available in the members-only TRACE Resource Center. For more information about TRACE Member Resources and to inquire about membership, please write tomembership@traceinternational.org. Catch up on TRACE Trends blog posts from November using the links below or click here to subscribe to the blog and receive weekly emails when new content is published. TASA: TRACE Anti-Bribery Specialist Accreditation®webinars are available to TRACE members at no additional charge. Register for a live webinar or view any recorded webinar in the TRACE Resource Center. For more information, contact info@theTASA.org. To apply for the TASA program and receive access to upcoming live and recorded webinars, please write toinfo@theTASA.org or visit www.theTASA.org. The Global Anti-Bribery In-House Network (GAIN)conference will be held in London, UK, October 5-6, 2016. 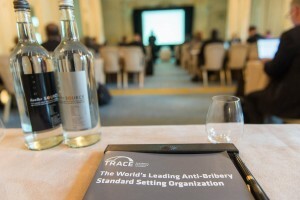 This high-level event provides an in-depth analysis of the latest international anti-bribery regulatory and enforcement developments. The agenda for this event is under development. To propose speaker or panel topics, please write to Virna Di Palma atdipalma@traceinternational.org. For more information on upcoming TRACE events, please write to workshop@TRACEinternational.org. TRACE Member companies receive complimentary access to TRACE Anti-Bribery Workshops to train local employees and third parties. This workshop will be hosted by TRACE in partnership with Wolf Theiss, EY Romania and the US Embassy in Bucharest. This workshop will be hosted by TRACE in partnership with the Baltic Institute on Corporate Governance. *Space is limited to 20 participants. Registration is first-come, first-served. To request an invitation, please write toworkshop@TRACEinternational.org. For more information on upcoming events, please write toworkshop@TRACEinternational.org. Wilhelmsen Ship Management is certified by TRACE International, Inc.
FIFA’s new president: Who will take over from Blatter?